First off, if there is any portion of the show that doesn't come through very well, we apologize in advance. Thomas had to conduct the interview using his Samsung Galaxy S4's speakerphone while recording on his RCA Android Tablet. 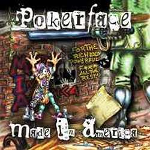 Pokerface is a controversial band whose views will cause them to be forever shunned by any major record label. They agree with the legalization of marijuana, oppose the prison industrial complex, and are anti-war. Topete identifies himself as a Christian, though he studies through resources available from independent pastor Arnold Murray, whose site is linked in the show notes. Freedompalooza: Note that the link provides information from last year's event. It's held around July 4th weekend every year and hosts band that are considered politically incorrect. Machine Gun Shoot: For those who are near Westpoint, KY.
Shepard's Chapel: Ran by Pastor Arnold Murray in Arkansas.